If you're wanting to jump on the reclaimed wood bandwagon, now's the time! If you're worried about finding the materials, finishing them off and installing, this is your product. It's called Stikwood. Revolutionary. I am confident you can do this yourself. It is actual wood pieces with heavy adhesive bands on the back making it an easy peel and stick day project. Brilliant. Another wood option is to make a mdf (medium density fiberboard) grid. If it sounds easy, you're right. All you need to complete this project are straight cuts of 1/2" thick mdf and maybe a level and tape measure. And then paint any color! I love this idea to spruce up a kid's room. Of course you can choose to keep an accent wall relatively simple and just paint it. But I think you could make it stand out a bit more; add a little love with some frogtape or a stencil and voila! you have yourself a one of a kind design. Look at a couple of these for inspiration. Wallpaper is nothing new to the design scene, in fact most people still curse it under their breath as they try to take it down. But I'm not talking about something like this. I'm thinking classy patterns, images and textures to accent what you already have in your home. I love the way grasscloth gives a subtle texture to your walls and adds a unique design element without a demanding presence. It comes in a lot of colors to truly match any decor. I am in love with what was done to these bookshelves. There are really so many different ways to use it. Are you eager to try something a bit more bold? 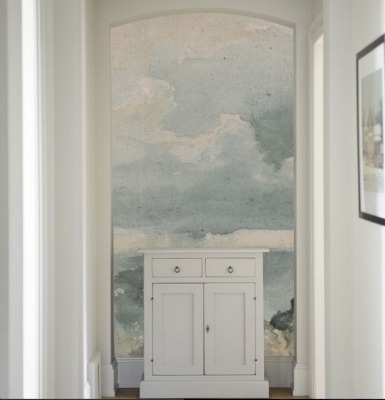 Perhaps a wall mural is what you need. I will warn that you do need a relatively plain wall to start, no windows, doors or architectural features. But look how amazing this looks! Yes, you read that right. A regular, plain old sharpie. Or maybe a fancy gold one, but still just a sharpie. If you're looking to be creative and have a little time on your hands, consider just making your own design. You can mimic subway tile, draw an artistic mural or create a living sketch pad on your office wall. Whatever you choose to do, know that if you ever don't like it, it's easily painted over. How simple! Check out what these DIY-ers did below! I love it! Anyone else already making a list for the hardware store? I'd love to know what you think or what you've done in your own space! Newer PostIf He Gets a "Man Cave", You Should Have a "She Shed"